You’ll have to forgive me, I have a bit of a rant here with on the level of discussion on the Internet around cameras. Don’t get me wrong, I like talking about cameras and other camera gear, and even to some extent the apparent strategies of various manufactures. Heck, I’ve even written a series of posts advancing ideas that I’d like to see implemented by camera makers. In fact, it’s probably safe to say that a good percentage of us photographers like engaging in these kinds of discussions. At the same time, I find myself continually annoyed by the level of discourse on these kinds of topics. A large part of that,I believe, stems from the near complete lack of good data and information to work in these kinds of discussions. As a result, it’s very easy to make claims that are both unsupported and subject to significant levels of bias. It’s not just commenters on various discussion forum who are “guilty”, if you can even call it that, of not being able to discuss things effectively. Many authors of articles published by the photography press have fallen in to the same traps of not having enough data to properly contextualize things they’re talking about — or worse just going for outright sensationalism like so much of the rest of the media. Certainly there is data out there on things like the demand for features and actual market share rates at a segment level. However, it’s almost always not publicly available, and in many cases almost certainly proprietary and so will never become publicly available. I’ve never been one for doing posts about the gear I use. In many ways, I don’t see the point. You’re not me. Your eye, your objectives, your interests, and so on, aren’t the same as mine. The natural consequence of that is that your gear isn’t going to, and probably shouldn’t, be the same as mine either. However, I was thinking about this the other day, and I realized that what I’ve used over time would prove to be an interesting look into my evolution as a photograpehr. When I realized that, I also realized that I was a little sorry that I haven’t regularly been writing up something about what I use and why. If only so I could go back and look at how my own preferences have changed over time. So I’m starting here. I’m not going to list every piece of gear I own or go through my camera bag and pull everything out and talk about it. I don’t have a fixed bag of gear; what I’ll have on me at any point changes based on what I’m doing and where I’m doing it. Instead I’ll be talking about what I find I gravitate towards most regularly, and why. That’s where I think the interesting things come from over time anyway. In late October of 2016, my family and I went on a 2 week road trip around the American Southwest. Over 14 days we drove nearly 1,400 miles visiting almost a dozen major points of interest. This is the first post in a serious of posts detailing my experiences in visiting and photographing those locations. Before I start talking about specific places, I want to talk a bit about my overall objectives with this series and the broader points around travel as it related to this trip. When I came back from Alaska in 2015, I wrote up a series of posts detailing my experiences — with an eye towards trying to maximize photographic opportunities — on that trip. In many ways, I like that idea if only because it leaves me a record of what I did right and what I thought I could do better given another shot. I’ve been struggling with trying to do the same for this trip, and I really mean struggling. In 2015, I managed to get my first article up within 2 months of coming back. This time I’ve been banging my head agains the wall trying to write about the experiences for almost 5 months now. I was recently reading the comments — I know, I know, I shouldn’t read comments — on Canon Rumors post about Lens Rentals Tear down of Canon’s new EF 70–300 f/4.5–5.6 IS USM II and a poster was lamenting about how Canon is redefining full time manual to mean something other than the focus ring being mechanically connected to the focusing mechanism. I see arguments like this come up over with some regularity when people talk about focus by wire, or electronic focus, lenses. Presumably, based on the tone of most if not all of these kinds of posts, it’s meant to be a complaint or criticism of electronic focusing lenses. And I just don’t see the point, I guess you could call it, that they’re making. Over the last weeks of 2016, I’ve been working on a lot of behind the scenes upgrades to my site here. About half of those change have been behind the scenes tweaks and improvements that make things more efficient. The other half has been a bit of an overhaul of the theme, layout, and front end. While I could go on to great lengths about the ins and outs of the design change and the code behind the scenes, that’s not really the purpose here. Instead, I want to talk about one specific area, displaying images on a computer, or rather how I’m increasingly finding computers a poor way to display images. For a while now, my gallery has been somewhat unloved, and I’ve not been especially happy with it’s presentation either. One of my objectives, though I didn’t know it when I started, with this update cycle was to do something about the gallery to make it more appealing to me. When the megapixel wars were in full swing, it wasn’t uncommon to find photographers poo-pooing the race to add more pixels. While there certainly is some truth to that point of view, it’s not entirely representative of the pixels situation. The counter point to the fewer better pixels argument is that more pixels really do capture more detail. Moreover, even if at the pixel level they are noisier, in the resulting images the noise becomes finer grained and as a result less distracting. The reality is, that so long as the increase in pixels isn’t causing a problem for other needs — for example, you aren’t limited to 3 FPS when you need 10 FPS to do you job — having more pixels makes better images overall. However, there are a number of places where this does fall apart to some degree. And ultimately this is where the real balance has to be struck between more pixels, better pixels, and marketing numbers that sell the next generation of cameras. I don’t generally make a point of posting updates about the goings and comings of content on this site, and in the past I’ve disappeared for months at a time with nary a word. However, this year I’ve been pretty consistently putting up at least something weekly. That said, since I started Points in Focus, I haven’t been in the sights of a Category 4 hurricane either. In fact, South Florida as a whole, hasn’t see a significant hurricane in over a decade. So here’s the deal as far as content goes for October and November. I already noted in my podcast a couple of weeks ago, that I would be backing off on normal written articles for a while. So that’s pretty much covered. I already had a lot on my plate for the second half of October and pretty much all of November so I wasn’t planning on getting anything significant out over that time period anyway. On the other hand, I had intended to keep doing my weekly podcast through most of this time. I’ve already recorded and uploaded the podcast for Thursday Oct, 6, 2016. It will publish at it’s expected usual time. Going forward, however, things depend entirely on the effects of Matthew on South Florida. Right now, by my estimates, the best case scenario I see is that my next podcast will be published on or after November 3rd, 2016. However, depending on the exact situation with Matthew, resumption of content may be considerable further in the future. I’ll try to keep this post updated if things change significantly in the coming days. Update 2016-10-14: The good news, for me and my family at least, was that hurricane Matthew passed far enough northeast of us that we didn’t receive anywhere near the winds and weather that I had anticipated, even in the best case. In fact, while we have notoriously unreliable power when there’s any kind of wind involved, we didn’t even lose power here. That said, while we weathered the storm much better than I had expected, between the mental and physical stress of preparing for Matthew, and the process of moving all the crap we moved inside back outside to where it normally lives, I’ve decided to stick with my previous schedule of posting my next podcast on the 3rd of November. See y’all in a couple of weeks. For the last year or so I’ve been talking about features I’d love to see implemented in camera gear. This time I want to talk about having a proper continuous modeling light built into a hotshot flash. Before I get into the meat of my idea, the first question one might ask is simply, what’s my problem with the status quo? After all, most hotshoe flashes in addition to being a flash, have some form of modeling capability (by strobing the flash tube) along with some form of autofocus assist capability (typically with red or near-IR LEDs). After all they do provide the intended functionality to a large degree. So what does having an actual LED modeling light enable that having IR autofocus LEDs or strobing the flash tube doesn’t? I have two main use cases where I think this would be a beneficial idea. First is for people who need to shoot video. Specifically I’m thinking about photojournalists, who are increasingly being asked to get video clips for their publication’s website, but the idea applies elsewhere too. With things as they are now, you ideally need a speed light for stills in a wide range of conditions, and a separate video light of some sort — at least potentially — for video. With my idea, you’d just have your speed light. The second case where I think it would be useful is in strait up using speed lights as a replacement for studio strobes. Admittedly this is also a personal point for me. I have nothing against studio strobes, I just never went down that path. However, I do a lot of product photography for this site, where I use speed lights in various modifiers (e.g., the Lastolite EzBox Hotshoe). The thing with studio shooting is that you don’t want ambient light contaminating the colors in the images you make. That means generally you keep the studio dark so the only light comes from the strobes themselves. With speed lights, that also means you don’t have much if any light illuminating the subject matter for focusing and composition. Okay, so clearly the idea here is that I’d like to see a continuous LED modeling light in a flash. Canon already did something kind of like this in their Speedlite 320 Ex. Well except not really. Yes, they put an LED on the light, but it’s not integrated with the zoom head, so it doesn’t actually model what the flash would do. Moreover, as far as I know it doesn’t track flash power, or have any kind of power adjustment at all. This is a drum that bears beating as often as possible. I was reminded of this point again recently, when a friends granddaughter lost all, or at least most, of her collage school work and pictures when the drive in laptop died. And with no backups, I don’t even want to think about what that must have been like for her. In my experience when I’ve done IT consulting work in the past, backups are one of the first things that get overlooked, ignored, or forgotten about. This is even more true, when the backup requires some level of user interaction. Proving my point, when I mentioned the above incident to my parents, my mom realized that she wasn’t backing up her computer at work. When it was setup, it was setup so that it could be backed up, but the act of plugging in a USB stick and running the backup command… Well, lets just say it got lost in the cracks. At the same time, backups need to be taken offline to be truly safe. If you’re backing up to say USB disk, and it’s still connected to the computer, the chance is always there that you might accidentally delete it. Or that one of the crypto ransom viruses, could encrypt it rendering it useless. Moreover, if the backup disk is still attached to power, there’s always the possibility that a power surge or lightning strike could destroy it. In short, if the disk is plugged in; it’s not a good backup since it could be erased or killed by a power surge. But if the disk is left unplugged, then the act of having to plug it in becomes a hurdle to getting people to actually back things up. Ultimately, I have 3 points in writing this. For those that aren’t backing up their data offer up some options that they might find useful to start backing up their data. A couple of weeks ago, when I was talking about the D500 again, I started to develop the idea that we photographers should be demanding more from the companies the make our cameras. At that time I was just thinking about quality standards. That got me thinking. Better quality is great, but you still need to understand how the camera behaves to use it optimally. When digital sensors replaced film, the cameras became more than just a vessel to hold the image forming material. They literally became the film too. Yet when this transition happened, we lost information that we previously had at our disposal too. If you’ve never shot film, or at least seriously investigated it, you’ve probably never seen the graphs below. 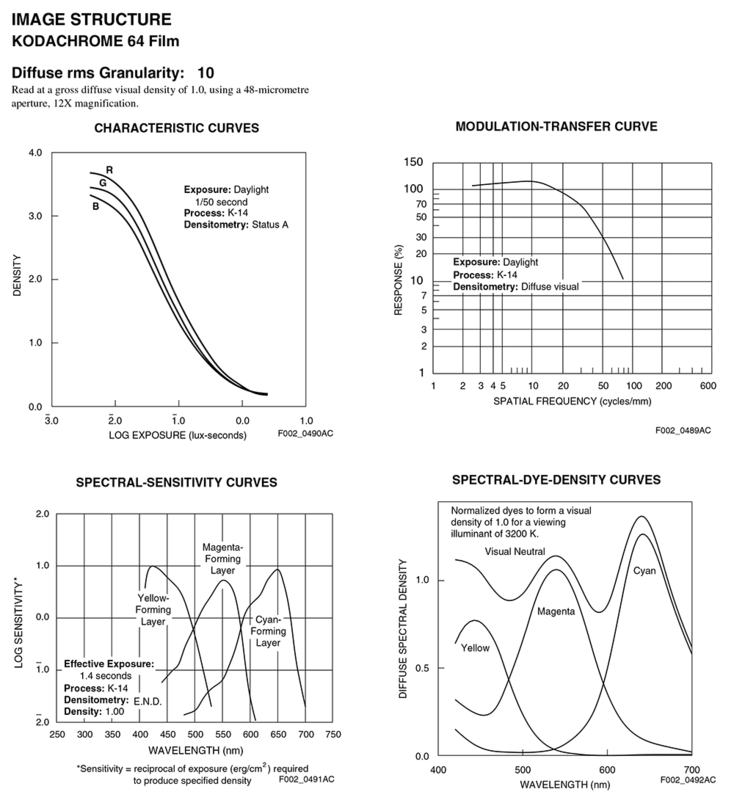 These graphs are the characteristic curves for a piece of film, in this case Kodak’s now discontinued Kodachrome 64. More importantly they tell you almost everything you could want to know about the film and it’s capabilities.